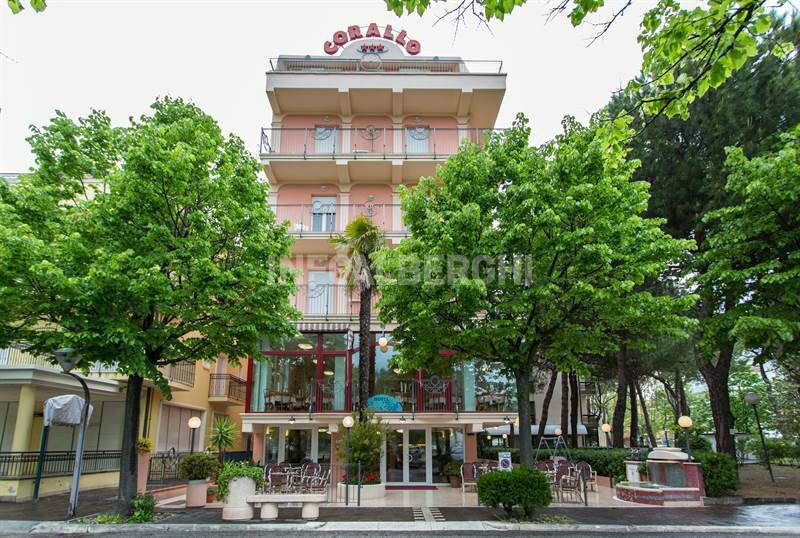 The Hotel Corallo is a 3-star family-run Misano Adriatico located a few steps from the sea in a wooded area close to the center. It offers WI-FI, parking and a kitchen also suitable for vegans and celiacs. No pets allowed. The hotel is just a 2-minute walk from the sea of Misano Adriatico, a town located between Riccione and Cattolica. The property is only 5 minutes walk from the train station and is located in an area well served by public transport, with which you can reach the main points of interest of the Riviera. Spacious and bright, all have balconies (some with sea view, located on the 5th floor attic), independent air conditioning, free WI-FI, door opening with card, telephone, safe, TV (digital terrestrial and sat), minibar and bathroom with shower and hairdryer. Cleaning takes place every day and on request you can have breakfast in your room. Garden, open-air porch, large hall with TV room, bar and reading room, elevator, free use of bicycles, beach towel. Theme nights are organized. PARKING: available for free, uncovered. 3 parking spaces in the garage, subject to charges. BREAKFAST: international buffet breakfast with homemade desserts, croissants and cold cuts. LUNCH AND DINNER: 2 menus to choose from (more variations) with dishes of local cuisine based on meat and fish, buffet of fresh salads, grilled vegetables and appetizers. Desserts and pasta are homemade. VARIATIONS: dishes for vegetarians, vegans and celiacs. OTHER: we organize aperitifs in the garden and theme nights. In the hotel: outdoor playground area, strollers and entertainment. On request: baby sitter and pediatrician service. At meals: seats at the table, placemats, baby menu and baby food. I n beach: swimming pool for children, entertainment, baby / mini / junior club. The hotel has an agreement with many bathing establishments with numerous relaxation and entertainment services (from 41 to 58). Swimming pool at the beach n. 42/43/44/45/46. Customers can choose the desired establishment. ALL INCLUSIVE: full board + wine or soft drinks with meals + beach service with pool access. - All Inclusive prices are applied only to adults.